Nintendo has yet to confirm the exact release window for its upcoming DS epic The Legend of Zelda: Spirit Tracks but that hasn't stopped online retail giant Amazon from picking the date anyway. The important day for UK gamers is 4th December, with Amazon selling Link's latest caper for £24.95 (down from a RRP of £39.99). Amazon has done this kind of thing in the past and been wrong, but they've also been right a few times, too. Needless to say, when clarification appears, you'll be the first to know. What about our US release!, This is the only thing that will hold me until The Legend of Zelda next year! Don't worry. North America will most probably get it earlier than we do. And if not: 90% of European releases (except a few like Pokémon) have 5 languages including English so you could import it anyway But like I said. I'm pretty sure NA will get it first. And here's me going off the latest information from my local games shop that says "24th September 2010"! 4th December is very late in the game for a release, though... if it has to be put back for any reason I can guarantee it'll go post-Christmas. I'm keeping my fingers permanently crossed from today. Your new avatar is extremely disturbing, James. Imagine my face when I see it in the morning every day. It's a lot like that photo, actually: an infinite loop of terror. "(down from a RRP of £39.99)"
£40 for a DS game?! Surely no retailer would actually charge that! Sweet! can't come soon enough for me (but I'm not complaining). These N games are always worth the wait as the big system sellers that they are. I, too love all the cartoon Zelda games, in fact that reminds me that I should go back and do Windwaker sometime, it was such a welcome new style to the Zelda series that sorely needed a new direction. I hope the next Wii iteration gets an injection of something a little different too. Not that it does me any good, considering I'm in Australia and not the UK. Hm. This is also the same company that says Sam & Max Beyond Time & Space for Wii is out now in the UK, only they're "temporarily out of stock". Take with a pinch of salt or 20 methinks. 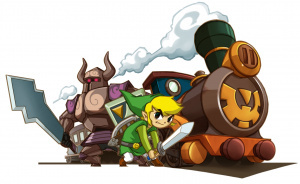 Enjoyed Phantom Hourglass, no reason this should not be good! Really excited for this one. Hope it comes to America soon. Phantom Hourglass is tied with Chrono Trigger for my favorite DS game and this one looks very similar to Hourglass so this should be great also. I saw this coming from miles away. "Holiday" usually means late November or early December for America.